Precision Pipeline, Inc. brings expertise in environmental compliance management of construction projects in the following areas: Mitigation planning and permitting; development and implementation of storm water pollution prevention; inspection and monitoring of projects; erosion and sediment control; as well as restoration and environmental training. We take a proactive approach in monitoring, adjusting, and ensuring successful work operations with minimal impact on the environment. Our workforce is aware of the environmental issues on every job we perform, and by stressing minimal disturbance as part of our work policy, projects are completed successfully with as little disturbance as possible. Our environmental planning starts as early as the bid process ensuring that the environment is considered in how we will perform the work. Many projects have some element of environmental mitigation that is required. We can help your company develop a mitigation implementation plan that details how to protect environmental resources throughout your construction project. Our team has experience dealing with a wide variety of environmental issues, including but not limited to, the maintenance and protection of protected animal and plant species and their habitats, aquatic resources (e.g. wetlands and vernal pools), and cultural resources. Technical review of pre-construction and compliance documents (e.g. permits and technical specifications). Construction projects have the potential to expose large areas of soil which increase the risk for soil erosion and runoff of sediment-laden storm water. Precision Pipeline, Inc. can develop and/or implement a storm water pollution prevention plan. Our team will design, install, and maintain your temporary and permanent erosion and sediment control. 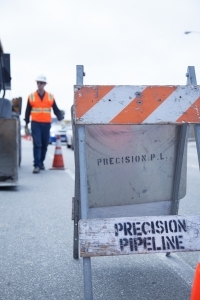 Precision Pipeline, Inc. will develop and deliver to personnel a training program specific to your project.